The grilled brie and pear sandwich caught my eye immediately! Last Thursday, the women on my block went to lunch for our regular monthly get together. We try out new restaurants and visit old favorites. Sometimes we go shopping afterwards or to a movie, but mostly we just talk and catch up with one another. This time we went to a new to us restaurant with a wonderfully eclectic menu. I don’t usually order sandwiches but grilled brie and pear just sounded so MMMMMMM! It was indeed! I had to come home and create the spirit of this wonderful melty inside, crusty outside grilled brie and pear sandwich for Wheels and Bytes – and me! Begin with wonderful crusty artisan sourdough bread sliced into eight large slabs. Add a circle of brie sliced thinly, a ripe large Bosc pear sliced the round way, butter, a bit of jam and, just to experiment, a whisper of mustard. Butter two slices of bread. That’s how many will fit in your 10 inch skillet at one time with room to turn the sandwiches. If you have a grill to do all at once, go for it. I haven’t tried it but this is probably a sandwich that would work well in a Panini press, too. Place the slab of bread butter side down in the skillet and shingle with brie slices. 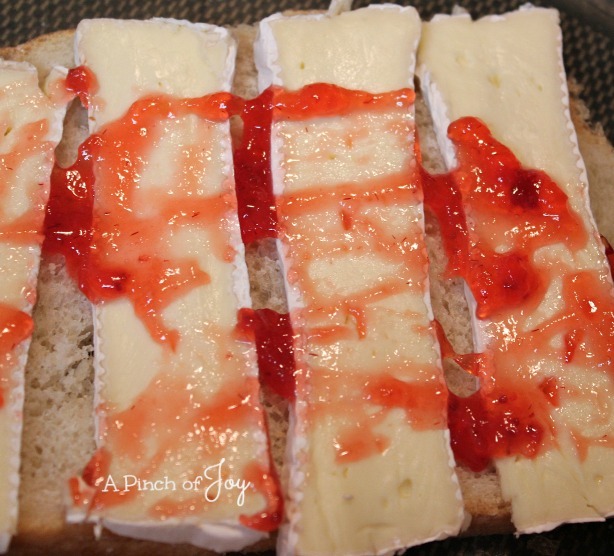 Slather a spoonful of jam across the brie. Add the pear slices. We experimented with just a bit of mustard on one half of each sandwich. Top with another slab of buttered bread with the butter side up. Toast over medium heat for as long as it takes the bottom bread to turn toasty brown. Be patient and let the cheese warm and begin to melt while the bottom toasts. When it is ready, carefully turn the sandwich. Let it brown on the second side. Press down to “seal” the sandwich together, remove and serve warm. I used strawberry jam because that is what I had open in the refrigerator. Raspberry jam would be good. The restaurant used a wonderful fig jam. Just enough to give a slightly sweet flavor. The mustard experiment? We liked the whisper of tangy mustard that played off the sweet jam and creamy brie. But the half without was pretty darn good too! A wonderful Sunday supper or perfect for a relaxing Saturday lunch. Now I know a great casual restaurant nearby for an evening out. And we have a special sandwich for an evening in. Win – win!! 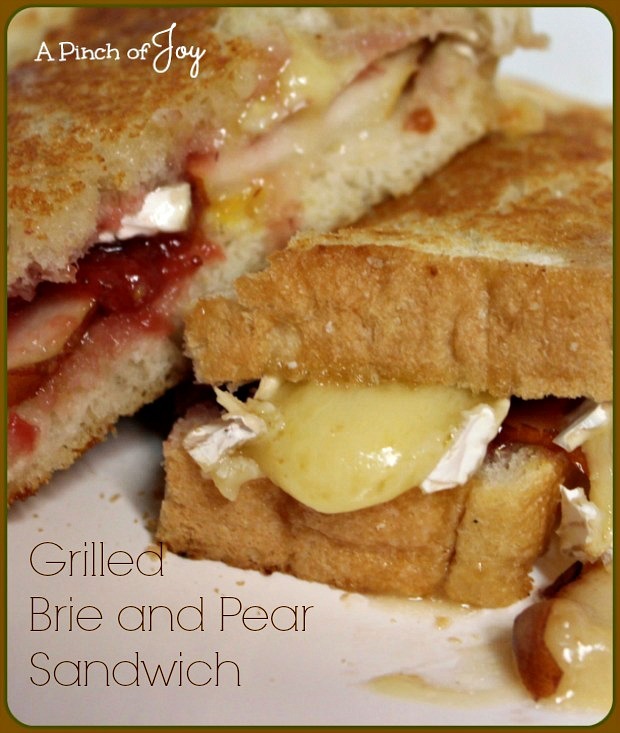 Creamy Brie with smooth pear and just a hint of sweet jam on sourdough bread, grilled to toasty sandwich perfection! Butter one side of each slice of bread. Place butter side down in large skillet. 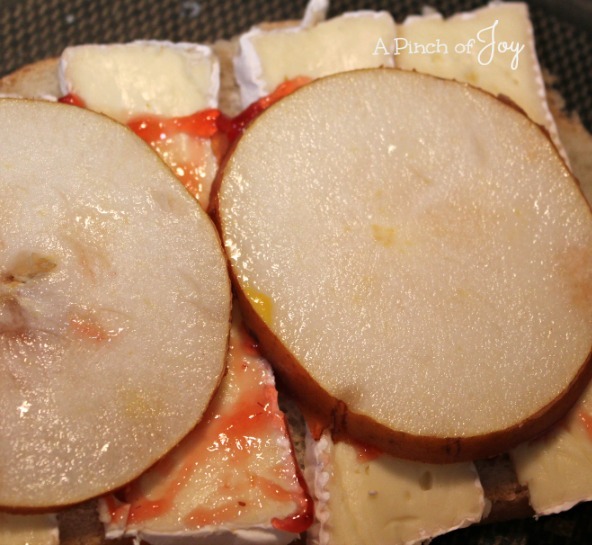 Build each sandwich by layering slices of brie, spreading jam over the cheese and adding slices of pear to cover the cheese. If desired, spread a bit of mustard over the pear slices. Top with another slice of bread, butter side up. Brown over medium heat until toasted and golden in color. Turn carefully and repeat for second side. I’m so glad you stopped by today! Be sure to follow A Pinch of Joy so you don’t miss a thing! Facebook, bloglovin’ twitter and check out my pinterest boards. If you found this helpful or inspiring please share below! Your support of A Pinch of Joy is appreciated! 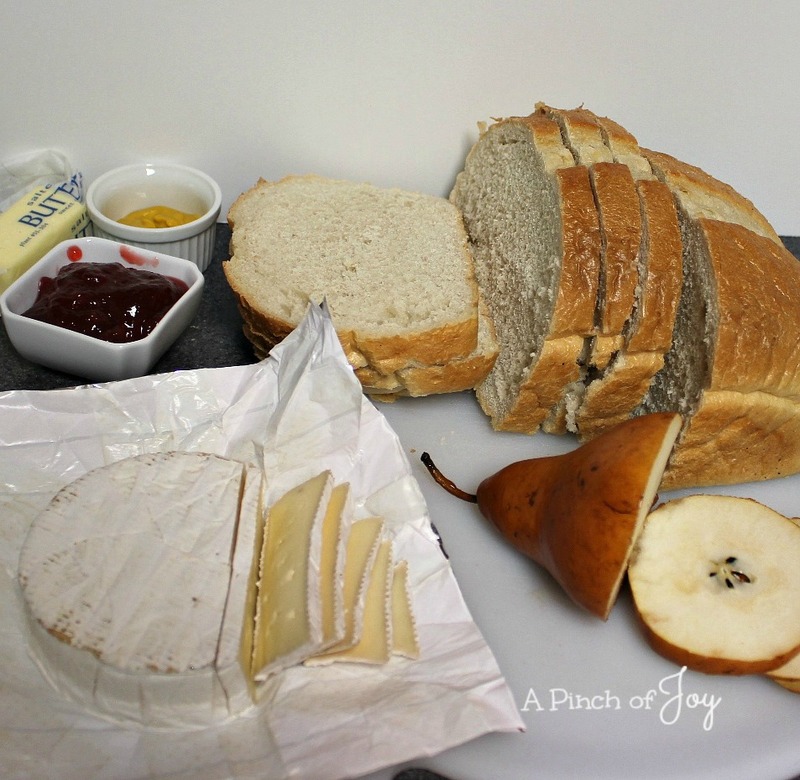 I love the combination of Pear and Brie, this looks so good! Thank you so much for sharing with Full Plate Thursday. Hope you are having a great weekend and come back soon! This is my kind of sandwich! Looks SO good!